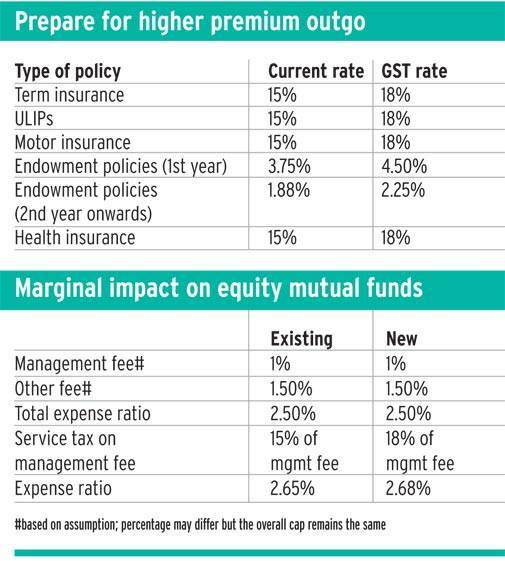 Here's how GST's impact on financial services, such as banking, insurance and mutual funds, will affect you. The Goods and Services Tax (GST), the biggest tax reform since India's independence, has announced the tax rates for different goods and services. These will be implemented starting July 1, 2017. Although the overall impact of GST - expected to bring uniformity in the country's tax structure, will be seen over time, it is pertinent to understand its impact on the cost of using various financial services such as banking, insurance, mutual funds, etc. We pay service tax on various services availed from banks, mutual fund and insurance companies. Service tax is an indirect tax and the Central Board of Excise and Customs (CBEC) is responsible for the formulation of policies related to levying and collecting indirect taxes. While the government has finalised the rate of GST applicable on financial services, the CBEC is yet to come out with a clarification and exemptions list. Service tax is currently levied at the rate of 15 per cent (including 0.5 per cent Krishi Kalyan cess and 0.5 per cent Swachh Bharat Cess) on most financial services. Under the GST regime, financial services will be the 18 per cent tax bracket. What this means is that you will have to spend marginally higher to avail these services. However, this may depend on the financial institu-tions you are associated with. M.S. Mani, Senior Director, Indirect Tax, Deloitte, says, "Under GST, the rate of indirect tax will go up, but the actual increase in the cost for an individual consumer will be seen over time as all these financial institutions will get the benefit of input tax credit under GST which was not available under current regime. This will reduce the cost for these financial institutions. If they consider passing on the benefit to consumers, which is most likely given the competitive scenario, the impact of increase in rate may not be much. But it will purely on the willingness of the institutions to pass on the benefit." On the occasion that the financial institution passes on the benefit of input tax credit to the customer, the impact of GST rate hike may be neutral or, in fact, the cost of these services may go down. More clarity on this will emerge over time. For now, let's look at how the increased rate of GST is likely to impact what you spend on financial services. A mutual fund house offers portfolio management services to investors. For this, it charges a management fee. On the management fee, which is a part of the total expense ratio (TER) of the fund, a service tax at the rate of 15 per cent is levied currently; this will go up to 18 per cent after GST is implemented. SEBI, the capital market regulator, has allowed mutual funds to charge service tax over and above TER. There is a cap of 2.5 per cent on the expense ratio of an equity mutual fund scheme. Therefore, if the asset management company (AMC) charges a management fee of one per cent and remaining 1.5 per cent goes towards other fees such as trustee fee, registrar fee, banking fee, custodian fee, marketing fee, commission, etc, then as per the current scenario, the expense ratio of the scheme will be 2.65 per cent - 1.5% + 1 *(1+15%). After GST, it will go up to 2.68 per cent. There are, however, AMCs that charge the entire expense ratio as management fees, as there is complete fungibility on the TER. In such cases, expense ratio will go up to 2.95 per cent from the present 2.88 per cent if the AMC charges 2.5 per cent, the maximum allowed limit. There could be another scenario. Jimmy Patel, CEO, Quantum Mutual Fund, says, "If the AMC charges the entire expense as management fees, it will pay the fees for other services from the management fees charged as its own expenses. By doing this, the AMC can claim input credit for the service tax charged by the service provider (say the registrar or custodian)." In the first scenario, as the fee for other services such as custodian and registrar is charged to the scheme, input credit cannot be claimed. According to Rajiv Shastri, MD and CEO, Peerless Mutual Fund, it is difficult for an AMC to charge the entire 2.5 per cent towards management fees as the expense ratio will shoot up and the scheme will have to perform much better than the peers to stay competitive. Also, brokerages charge service tax on the brokerage paid by the fund house. Currently, the transaction cost including brokerage is charged as investment cost - if the AMC buys shares of Rs 100 and the brokerage is two rupees, then the cost of purchase will be considered as Rs 102. In case the shares of a company go up to Rs 115, then the investor will gain three rupees (Rs 105-Rs 102) and not five rupees. But SEBI has put an overall limit of 0.12 per cent and 0.05 per cent on this transaction cost for the cash and derivative markets, respectively. "If the transaction cost goes beyond this limit since GST will be charged at 18 per cent on the brokerage fees, the AMC will have to include it in the TER. This may further increase the TER. If that is not possible, AMC will have to take it on its books which will impact the profitability," Patel says. He is certain that the expense ratio of mutual funds will go up for sure. "I think the approximate increase will be of around five basis points (100 basis points is equal to one per cent)," Patel adds. A bank charges service tax on most transactions - online money transfers or withdrawals from ATMs beyond specified limits. With GST, these services will now attract a tax of 18 per cent instead of 15 per cent service tax, charged currently. For instance, if you withdraw from another bank's ATM after exceeding the free transaction limit, you are charged Rs 20 plus service tax which comes to around Rs 23; post GST, this will go up to Rs 23.60. However, experts are hopeful that the increase in cost may not last in the long run as banks will pass on the benefit of input tax credit, under GST, to their customers. "Services such as FDs and bank account deposits that do not have an associated charge currently will continue to remain outside the GST net. The final list of exemptions from the flat 18 per cent tax rate is still awaited," says Adhil Shetty, CEO and Co-founder, Bankbazaar.com. When it comes to insurance, a service tax is levied on risk premium. In cases of term, motor and health insurance, the entire premium is considered as risk premium; therefore, service tax is levied on the entire premium paid. In theory, this could mean an increase of 3 per cent in premium from the existing applicable premium, effective from July 1, 2017, across life, health and general insurance. However, some of this should be offset if tax on services availed by the industry are allowed to be taken into account to decrease insurers' tax paid. Vighnesh Shahane, CEO, IDBI Federal Life Insurance, explains this further: "If the premium of the term insurance policy is Rs 20,000 (including taxes), you will have to pay Rs 600 more (3 per cent more) after July 1. However, we may be entitled to an additional credit against taxes that have been subsumed under GST. The law states that any benefit on account of input tax credit needs to be passed on to the consumers. We will work with the insurance regulator and the council on this. However, whether premiums fall over time still remains to be seen." "In case of ULIPs, although service tax is not chargeable on the premium, the following charges are liable for service tax (including SBC & KKC) at the rate of 15 per cent - surrender charges, fund management charges, policy administration charges, switching charges, mortality charges and allocation charges," says Miranjit Mukerjee, Chief Financial Officer, Future Generali India Life Insurance. Endowment premium consists of both insurance and savings cover premium which are not clearly identifiable in the premium charged to policyholder. The savings part is not liable to be taxed as per service tax rules. In fact, endowment products were not subject to service tax till April 2011. Due to the component of protection cover in endowment products , government has fixed a rate for new business and renewal premiums considering 25 per cent of the premium as protection cover in new business and 12.5 per cent in renewal business since May 2011. Therefore, on endowment products, a service tax (including SBC & KKC) is levied at 3.75 per cent of the premium for the first year and at the rate of 1.88 per cent on renewal premiums. It will go up to 4.5 per cent in the first year and 2.25 per cent in the second year. Currently, any person indulging in either buying or selling of a stock on an intraday or delivery basis has to pay service tax on the brokerage amount. This brokerage amount is generally charged on the turnover amount and varies from broker to broker. Apart from service tax, there are government taxes such as stamp duty, which is state-dependent, and transaction charges, which is exchange-dependent, SEBI turnover fees and securities transaction tax, too. Post GST, there will be only one change. "All other charges would probably remain constant except service tax on brokerage which will increase from 15 per cent to 18 per cent, although variable," says Achin Goel, Head of Wealth Management and Financial Planning, Bonanza Portfolio. Construction of a property is considered as a service the builder or developer provides to home buyers; therefore, service tax is levied on under-construction property. 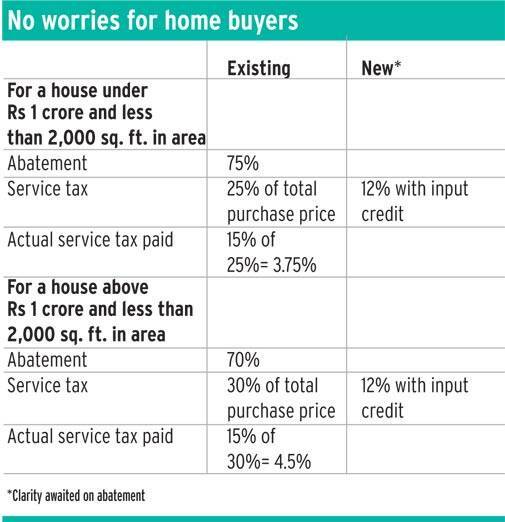 While in the case of fully-constructed houses, service tax is not charged. The stamp duty levied on fully constructed property will remain. Service tax is to be paid on the cost of providing the service of construction and not on the value of the land. So the purchase price of land and the value of construction services provided needs to be shown separately. Since it is not always possible to segregate the two components, abatement has been given - service tax at the rate of 15 per cent is levied on 25 per cent of the value of property in case the property is worth less than one crore rupees and less than 2,000 sq. ft. in area. In case the property is valued at more than one crore rupees and the area is more than 2,000 sq. ft., service tax is charged on 30 per cent of the value of the property. Now GST will be charged at the rate of 12 per cent on under construction-properties. However, abatement clarification in this regard is awaited. "While service tax across states in the current service tax regime is 4.5 per cent (with abatement), some states charge VAT in the range of 1 to 5 per cent. With the input tax credit on construction materials available in full, the effective GST rate on real estate should be less than 12 per cent. 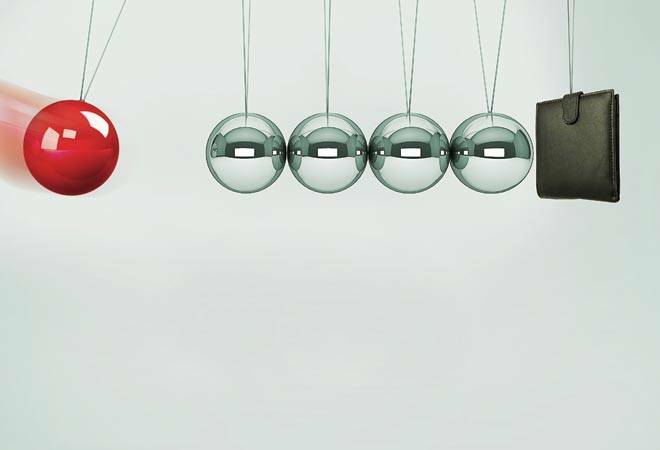 Compared to the current taxes, the GST rate is likely to be in the range of neutral to slightly negative depending on the service tax and VAT rules that are prevalent in different states," says Anuj Puri, Chairman, JLLR (JLL Residential).